W. W. Norton & Company, 9780393330298, 384pp. Award-winning historian Martha Hodes brings us into the extraordinary world of Eunice Connolly. Born white and poor in New England, Eunice moved from countryside to factory city, worked in the mills, then followed her husband to the Deep South. When the Civil War came, Eunice's brothers joined the Union army while her husband fought and died for the Confederacy. Back in New England, a widow and the mother of two, Eunice barely got by as a washerwoman, struggling with crushing depression. Four years later, she fell in love with a black sea captain, married him, and moved to his home in the West Indies. Following every lead in a collection of 500 family letters, Hodes traced Eunice's footsteps and met descendants along the way. This story of misfortune and defiance takes up grand themes of American history--opportunity and racism, war and freedom--and illuminates the lives of ordinary people in the past. A Library Journal Best Book of the Year and a selection of the Book of the Month Club, Literary Guild, and Quality Paperback Book Club. In what ways can Eunice be described as an unconventional woman ahead of her time? In what ways can she be described as a conventional woman caught up in her own time? Other than Eunice, which historical actor or actors did you find yourself most drawn to or interested in? For whom did you feel sympathy or antipathy? Did your feelings toward various family members change over the course of the narrative? What surprised you most about the daily lives and labor of working-class women and families in 19th-century America? Most historians and biographers choose to write about well-known people from the past. What is the value of writing about a completely ordinary and unknown person? Imagine Eunice herself reading The Sea Captain's Wife. What might she think of the way Hodes shaped her story and the meanings Hodes found within her life? Eunice wrote to her mother: "I write you a good many letters that I dont send. When I feel lonesome and bad as if I must see you, I set down and write, then the next day burn them up." Imagine some of the contents of the letters Eunice burned. If the author could find just one more letter from Eunice, what subject or question would you most hope it would address or explain? The Civil War acts as a catalyst to much of Eunice's story, including her experiences in the Deep South, her return to New England, and many of her losses. What larger aspects of the Civil War did Eunice's story illuminate for you? Hodes writes that "In her voyages from New England to the Deep South to the British Caribbean, Eunice also made a journey from the life of an impoverished white woman in the United States to the life of an elite woman of color in the West Indies." Hodes also notes that "In New England, Smiley was not a white man, but in the West Indies, he was not a black man." What do these episodes of ambiguous or changeable racial definitions tell you about the larger concept of race? In her letters, Eunice often conveyed the precariousness of life by invoking the common 19th-century phrases "if nothing happens" and "if I live." Are there ways in which these phrases resonate for you in the present day? What if Eunice had refused Smiley Connolly's proposal of marriage? Speculate about what turns her life might have taken if she had remained unmarried or if she had married a white man of lesser means. Hodes employs a number of unconventional forms for a work of non-fiction. She renders Eunice's words in italic type and without quotation marks as a way to integrate Eunice's perspective "more seamlessly into the story." She also opens each of the book's core chapters with a single complete letter written by Eunice, in order to "give readers a sense of Eunice's voice" and includes a photograph of the first page of each of these letters. As a reader, how did you respond to these literary strategies? Hodes invokes two epigraphs in The Sea Captain's Wife. At the outset she quotes Emily Dickinson: "I'm Nobody! Who are you?/Are you--Nobody--Too?" and toward the end she quotes T. S. Eliot: "These are only hints and guesses,/Hints followed by guesses." Why do you think Hodes chose these lines? What meanings do you find in them for Eunice's story? Hodes visited the various places where Eunice lived and describes them as they appear in the present day. Hodes also found descendants of the Richardson and Connolly families in the course of her research. How do these forays into the present day affect the story of the past that Hodes tells in The Sea Captain's Wife? 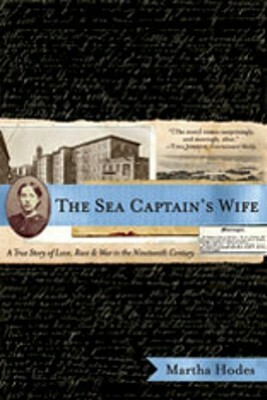 How would you describe the author's voice in The Sea Captain's Wife? What does Hodes's voice convey about her relationship to Eunice? At the book's outset, we learn that Eunice drowned in a hurricane. How did this early revelation affect your experience of reading the book? How did you feel when you came to this episode again, at the end? In interviews, Hodes has said that the advantage of writing Eunice's story as nonfiction is that everything in the book is true. Still, what would be gained if Hodes had written this book as a novel? What would be lost? If you were to write and direct a film based on The Sea Captain's Wife, how would you structure the movie? Which actors would you ask to play the different characters? Did Eunice inspire you in any way? Did she disappoint you in any way? In what ways does Eunice's story feel meaningful for the 21st century?